Bronze ring hangs from beak of an eagle on the Palace of Charles V, The Alhambra, City of Granada. 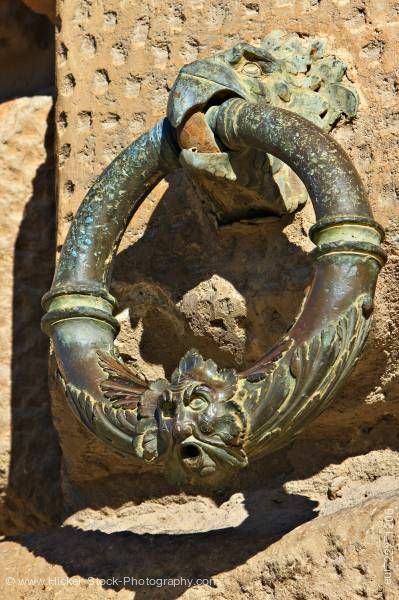 This stock photo of a discolored bronze ring is hanging from the beak of an eagle on the Palace of Charles V (Palacio de Carlos V), The Alhambra (La Alhambra) - designated a UNESCO World Heritage Site, City of Granada, Province of Granada, Andalusia, Spain, Europe. A well worn bronze ring hangs from the Palace of Charles V. The bronze ring sits in the mouth of an eagle which is attached to the stone wall of the palace. On the bottom of the ring is a man’s face with his mouth open and long branches of leaves go up each side of the ring from the man’s head. The walls of the palace are stone and mortar showing a lot of wear from time and weather. Bronze ring hanging from the beak of an eagle on the Palace of Charles V (Palacio de Carlos V), The Alhambra (La Alhambra) - designated a UNESCO World Heritage Site, City of Granada, Province of Granada, Andalusia (Andalucia), Spain, Europe.